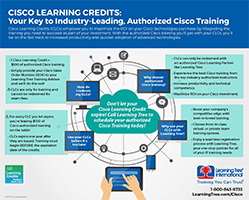 Cisco Learning Credits (CLCs) empower you to maximize the ROI on your Cisco technologies purchase by integrating the training you need to succeed as part of your investment. Redeem your CLCs with Learning Tree and experience best-in-breed Cisco training taught by leading industry-authorized instructors. 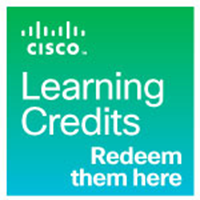 If you are using Cisco technologies at your organization, there is a good chance you have Cisco Learning Credits available to you. Check with your IT manager or colleague who manages software licensing to find out. Click here to view our list of partner-delivered Cisco authorized courses, all of which are eligible for CLC redemption. Take the first step toward a Cisco networking career with CCENT certification. Gain fundamental network engineering skills with Cisco CCNA Routing & Switching. Confidently secure networks and mitigate risks with Cisco CCNA Security certification. Optimize your wireless technologies with Cisco CCNA Wireless certification. I thought Eddie was excellent. He made it easier to understand the material with his teaching approach, it was entertaining and educational. The stories he used as examples and relating it to the course material helped me learn better.